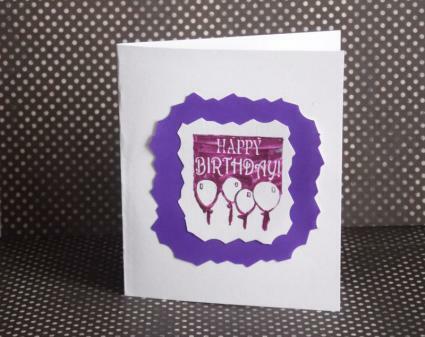 If you like to make cards and stationery, it seems like you can never have too many ideas for rubber stamping designs. There are always more cards to make, more stamps to try, and more techniques to master. This basic design takes no time to do and is a great way to show off a simple sentiment. It also leaves plenty of space for you to write a note to the card recipient. Stamp your sentiment in the middle of the front of the card base. 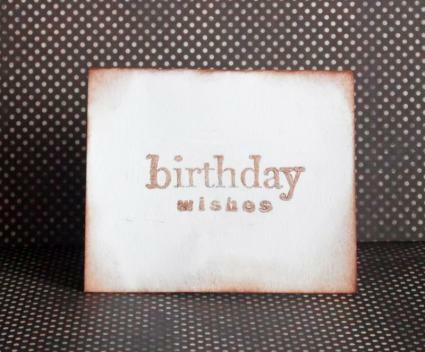 Lightly drag the edges of your ink pad around the card base to create a slightly distressed look. Write your personalized note inside of the card. Instead of stamping your image directly on the card, stamp it on a piece of card stock instead. This lets you practice your technique until you're pleased with the results. Stamp the sentiment image on your white card stock. Trim the paper with the decorative scissors. Glue the stamped image to the colored paper and trim the colored paper with the same scissors to create a border. Glue the colored paper to the front of the card base. For something a little more interesting, choose a stamp with a design that would benefit from the addition of color, such as a large flower. Use colored pencils, ink pens, fine-tip markers, pastels, or whatever you have on hand to color in the stamp, just like you would color a page in a coloring book. 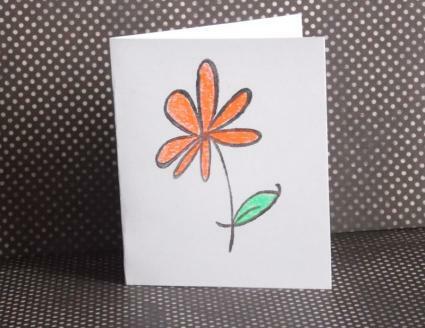 Stamp a flower image on the front of the card base using black ink. When the ink is dry, start coloring in the stamp. Add the desired message inside the card. If coloring isn't your thing, add visual interest to your card by inking your stamp with two different colors. If you don't have access to ink pads in multiple colors, this technique can also be done with markers in the colors of your choice. Apply the red ink to the right side of the stamp. Carefully blow on the stamp so your breath re-moistens the ink. Stamp the image on the front of your card base. Use the same stamp multiple times on the same card to create an interesting pattern. This is a great way to use multiple ink colors as well. 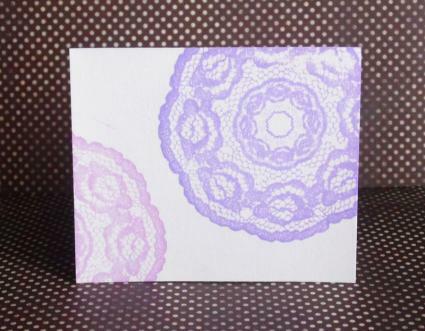 Stamp the lace image on the upper right corner of the front of the card base using purple ink, running off the side as needed. Stamp the lace image on the lower left corner of the front of the card base using red ink, running off the side as needed. 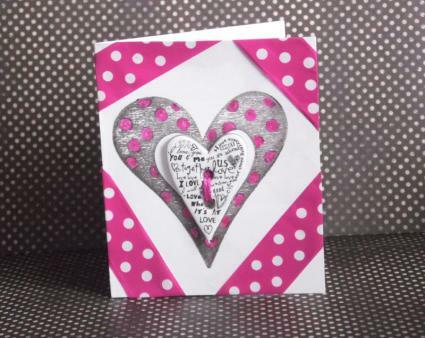 Use cut out punches to add interest to a stamped card. This only takes a few seconds to do. Make sure you punch first and then stamp so that the images will be visible when the card is closed. Lightly ink the text stamp with the black ink. Stamp on the front of your card, creating a faded book page pattern. Use your blue ink stamp pad directly on the card to create a subtle pattern over the text, stamping a series of overlapping squares. Punch a large circle in the front of your card. Stamp the message on the inside of your card, checking to make sure your design will be visible from the front window you just created. Don't stop at rubber stamps unless you want to. You can always draw on your cards, add charms, put on stickers, embellish with ribbon, or use just about anything else from the scrapbooking aisle on your cards. If you have time and lots of creativity, you can make your cards true works of art. Stamp a heart image in the center of the front of the card. Color dots inside the stamped image with the metallic ink pen. Use washi tape to add a colorful, offset border around the edges. Tie embroidery floss through the holes in the chipboard button, trimming with scissors as needed. Use double sided tape to attach the chipboard button to the card. Add the desired message to the inside of your card. Once you've mastered these basic techniques, you can start branching out to create even more unique cards. Embossing - Using a heat gun, pigment ink, and embossing powder, you can quickly make an image that is raised up from the surface of the card. Combining embossing with coloring can make an even more dramatic looking card, and it's much easier to avoid coloring over the lines when the lines are raised! VersaMark - Tsukineko's VersaMark Watermark Ink Pad makes it easy to create interesting effects on your cards. Stamp on colored cardstock for a subtle tone-on-tone design. 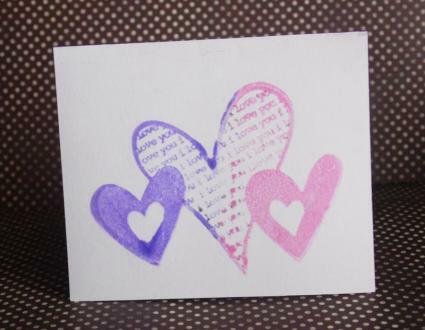 Stamp on white cardstock, then lightly brush over your image with chalk for a different look. Glitter Stamping - Stamping with glue and then sprinkling fine glitter over your image creates an eye catching effect. The Martha Stewart Crafts Glitter Stamp Starter Kit contains everything you need to begin experimenting with this technique. 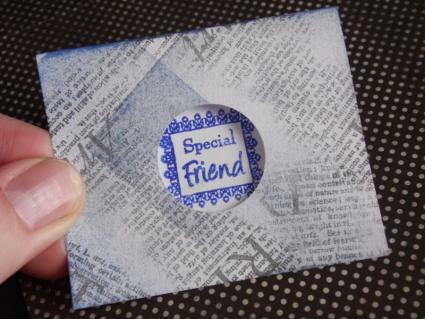 Rubber stamps are extremely versatile card making tools. Depending upon what techniques you use, the same stamp can have multiple looks. Don't be afraid to practice stamping on scratch paper to see what ideas you can come up with.